In this part of the Contact Centre Manifesto series, we look at how contact centres can build long-term planning into their daily work. It’s a cycle that can be hard to break; despite the best intentions to sit down and strategise, another busy day means lurching from problem to problem. And because there is no forward planning in place, better call handling solutions never materialise. Acting in crisis mode doesn’t just put pressure on SLAs, budgets, and staff well-being – it tends to foster poor decision making too. 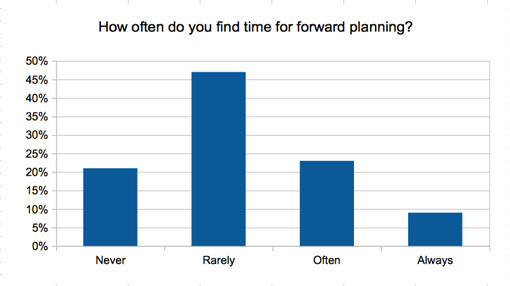 In a recent webinar, we asked contact centre planners how often they manage to plan ahead. Surprisingly, around two-thirds said they ‘rarely or never’ have the opportunity. Almost every contact centre has some kind of plan in place for fire, floods, and storms – far fewer have a plan for unexpectedly high contact volume. And although a flood is much more dramatic, high volume is much more likely. Some of the worst decision making comes about during those ‘all hands to the pumps’ moments, when managers and staff have to make one big decision after another. One practical solution to this is to find at least twenty minutes a day to answer a key question about your contingency plan. In ten working days, you’ll have the outline of a solid strategy. How will you identify and address the root cause of these contacts? What would the immediate challenges for staff and systems be, and how could you manage them? Can you temporarily reduce call lengths by dropping non-vital elements like up-selling? When you need to keep staff informed of a changing situation, who delivers those messages and how? On an average day, how many staff could do overtime or start their shifts early? In case of an external event (like a product recall), what other business departments might you need to liaise with? Do you have an outsourced overflow capacity in place, and how is it activated? Can you interflow calls to other teams? What special measures might you need to keep staff motivated? What is it that drives stress when call volumes are increasing? 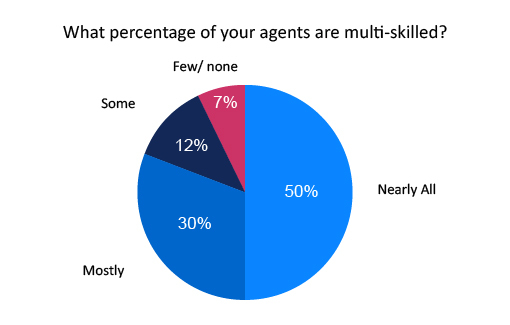 It’s often assumed that the greater workload is what pushes agents harder. While that is certainly a factor, it’s not the full story. A Unison study of 3,000 UK contact centre agents found that the biggest reported cause of stress was ‘unrealistic targets’. Of course, the more contact volume increases, the less realistic those targets become. 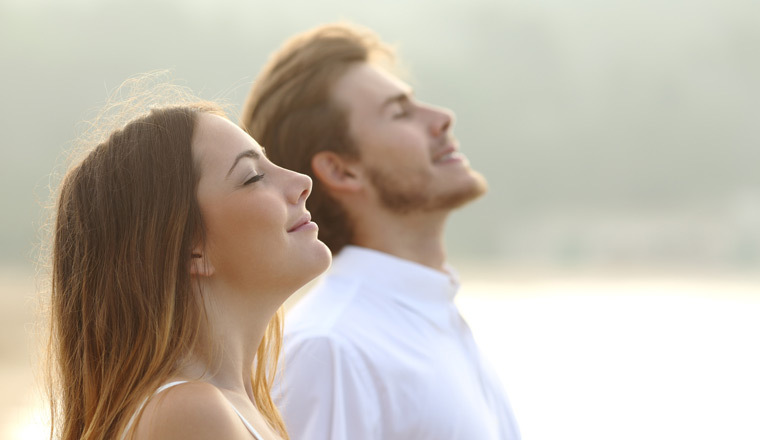 Stress can also be contagious. Research from the Max Planck Institute for Cognitive and Brain Sciences has demonstrated how the presence of just one person struggling with a task raises levels of stress hormones in the people around them. The stress issue is especially relevant to live updates of contact volume. While some businesses think showing live updates can help keep focus, there is growing suspicion that their main contribution is to staff anxiety. Obviously, businesses have to measure progress. However, putting operational metrics in front of agents can do a lot of damage. One reason for this is that it’s not always clear how to achieve the targets, even to supervisors on the ground. Without clear advice on how to improve FCR or reduce the queue, most agents will simply rush through their work. Another problem is that many businesses have poorly aligned KPIs, focused on internal and transactional measures of success. CX strategist Colin Shaw recommends a ratio of customer experience measures to internal measures of 70:30. Why? Because while good customer experiences are a consistent goal for staff, short queues and calls are a moving target. If every member of staff is aligned with a common objective – the ‘North Star’ of your contact centre – they don’t need to worry about changing their approach from one interaction to the next. This, of course, is the key to consistent service. How can leaders make sure they have the breathing room they need to think beyond the end of the week? The first thing that needs to go is any anxiety about taking time away from the shop floor. Leaders like to be engaged in moment-to-moment operations, but time spent planning is not a waste – it’s an investment in the future of the business. Finding time isn’t something that happens by accident, though, and leaders need to be proactive. If you can work from home once a week, take that opportunity. The temptation to get involved in every event at work will crush any chance of seriously getting down to forward planning. It takes around 25 minutes to re-engage with a task after an interruption, so even a colleague poking their head around the door with a ‘quick question’ can be a major disruption. To get the full effect, spend the day without email, and make sure you’ll only get calls for real emergencies. It also shows trust in staff if they can be left without a guiding hand. Even if there is a situation while you’re away, if you have the right team in place, it won’t be a problem. Strategising isn’t a solo activity, and the entire management team needs to be involved in the process. Team meetings and training can benefit from being held away from the distractions of the office where they won’t be disturbed. Even when the meeting is important, the second call volume picks up, your colleagues are going to be agitating to get back on the floor. That’s a good sign that your team are involved in their work, but it doesn’t help them get out of short-term mode. Taking these group sessions away from your building puts the team in a different ‘mode’, helping them to engage with the task at hand. Seeing their colleagues in a different environment has also been shown to boost team relationship building. Whatever your level of experience, implementing business improvements is a matter of trial and error. But if you can speak to your colleagues in the industry, you can learn from their errors – without facing the same risk of failure. Visiting award-winning contact centres can be a great insight into the specific processes that other businesses are benefiting from. More than that, they can be a great insight into the underlying culture that makes process improvements possible. 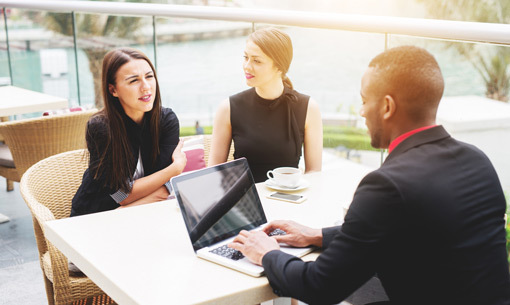 It goes without saying networking is always a helpful activity, and research from Virgin Business has shown that 95% of senior decision makers consider face-to-face interaction essential to forming meaningful links. We regularly visit call centres around the country in order to learn from what they are doing. Click here to see our site visit articles. According to 2014 findings from the American Psychological Association, the simple activity of walking is one the best ways to stimulate creative thinking. It’s certainly the simplest. Compared to finding the time and the space at work for meditation, yoga, or painting classes, going for a twenty-minute walk should be quite straightforward to arrange. For leaders who struggle to make the planning time they need, the cumulative impact of a few weeks’ worth of daily walks might be the best way to get the broad view of operations. Doing this over a lunch break means it won’t even take time away from the working day, and it’s great for health. Here’s a question: to what extent do front-line agents and their supervisors understand the business goals that drive contact centre practice? The first step in solving a problem is understanding it – so how many members of staff understand the problems that the business faces? In most cases, it’s very few, and the prevailing attitude is ‘business as usual’. There are a lot of ways managers can find out more about call drivers, from voice analytics to wrap-up codes. However, to get a holistic view, agents have to be personally involved in development. The common response to this is, ‘Sure, but we can’t find time in the day.‘ If that’s the case, what about time in the evening? For the price of a few pizzas, managers can host group conversations after hours that are part social, part brainstorming. These less formal events tend to be the best way for staff to swap ideas and get an honest appraisal of what the business hopes to achieve. A lot of businesses use suggestion boxes, but Richard Harrison from Geminus Training suggests this might be a weak option: “The thing about the suggestion box is all you do is write down the idea and expect someone else to do something about it. But if you engage people at the right point on doing something themselves, then you’re starting a culture where instead of talking about problems, they’re actually solving them. Here’s another bad cycle that parts of the industry are stuck in: low retention means low investment in training, which continues to foster low retention. To break out of this pattern, businesses often have to invest in expensive and wide-reaching initiatives to change recruitment and coaching. Needless to say, there isn’t always room in the budget to get this done. Perhaps the best alternative is to provide additional training more selectively. Paula Wingate, Founder of Influential Minds, explains that, “To activate the business culture, businesses should pick up the top 20% of the front-line staff to do additional training. You show that you’re investing in your top staff, and you’re creating a culture where people want to earn that. It shows commitment to your best staff, and encourages the other staff to want the same for themselves. Most people have a wide array of skills and experience that they don’t bring into the workplace. Why is that? According to Richard Harrison, “People conform to the culture they work in, and as a result, they don’t tend to bring in personal characteristics that they don’t think fit with the culture. “They have a ‘work persona’, which is only about 20% of their collected knowledge and creativity. Normally that persona aligns to either the organisational culture, or their job description, or a combination or both. ‘This is my job description, this is what I’ve got to do every day, therefore, if I deviate outside that box I’ll be put down upon’. “When we ask about barriers, more often than not it includes management, and even specific managers or supervisors. One thing we’ve done with some organisations is train up an innovation champion. They’re responsible for working with the individuals to filter the good development ideas from the not so good ideas. For more on this subject, visit our page: How Do I… Measure Employee Engagement? To avoid knee-jerk decision making, staff need to be able to keep their heads when things get busy. 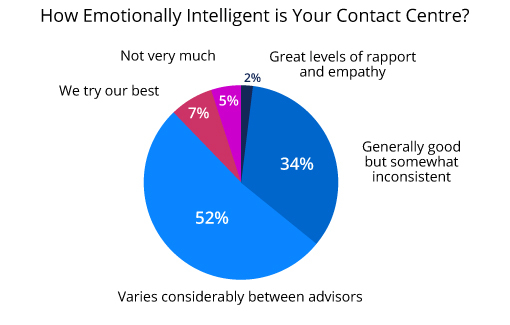 All the soft skills in the world won’t help to achieve that, which is why contact centres increasingly recruit and train for Emotional Intelligence (EI). When TalentSmart conducted research on EI they found that it was more strongly correlated with success than any of the other 34 professional skills measured. They also discovered that 90% of top performers display above-average EI. In one webinar poll, we found that EI still appears inconsistently in contact centres, even though it is the type of environment that could most benefit from it. Agents will burn out if they take the emotional baggage of one interaction with them into another, and they will not be able to offer a consistent service. Business trainer Jacqui Turner has seen Emotional Intelligence deployment help in a number of settings: “If contact centres want to improve their customer satisfaction rates, staff need emotional intelligence training that is incorporated into their customer service training, so that they can deal with the emotions that might affect the next call they take. With training, agents can build up resilience, effectively resetting themselves between each call. This is especially useful in periods of high volume, when calls tend to have a more negative tone. If customers are not happy with the wait, they are likely to let the agent know – meaning the agent hears the same complaints many times. Delivering this kind of training will also help team leaders to spot and support members of their team who are struggling with the workload. In most cases, it’s the team leaders who have the best blend of operational awareness and front-line experience. But how best to access that experience? There are only so many seminars and feedback sessions that you can organise. Assertiveness training is an interesting approach to hearing more of what team leaders have to say. It’s a blend of communication skills and EI that helps junior leaders to put ideas across to managers in the most appropriate way. 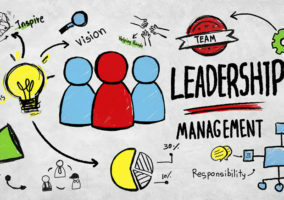 “The supervisors need to feel confident that when they know they’re working on the right things, they can communicate that back up the line to managers. Managers depend on honest on-the-ground reporting from supervisors to direct strategy. Although dealing with a lot of ‘yes men’ is easy in the short term, it always creates problems further down the line. Assertiveness doesn’t mean being argumentative – it means being able to form an opinion and explain it clearly to others without worrying too much about seniority. The supervisors of today tend to be the managers of tomorrow, so it makes sense to teach them these key skills early. The idea of multi-tasking is very tempting when there is a lot of work to do. For managers and supervisors, this usually means progressing reports while fielding questions from junior staff and answering the phone every few minutes. The evidence certainly does say this, with research from Psychology Today showing that trying to multi-task saps as much as 40% of our productivity. The fact is, multi-tasking is a skill that doesn’t really exist – the best we can accomplish is rapid switching between several tasks. So, what does this mean for strategy? For leaders, it means being much more firm on the scheduling of tasks to maintain a tight focus on one project at a time. In particular, managers need the freedom to commit to a activity without being pressured to move on to another, or tackle both. This is the kind of change that has to be driven and supported by senior management – although counter-intuitive at first, it will yield better productivity. What about agents, though? 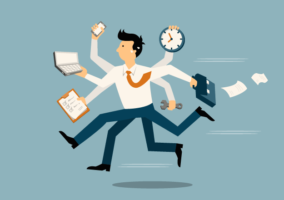 Trying to multi-task will also hamper them, but multi-skilling can unlock a lot of their potential. Our poll on this topic revealed that a high percentage of contact centre are now cross-training most of their staff. Aside from being able to contribute to the business in more diverse ways, multi-skilled or ‘blended’ agents enable contact centres to keep more staff on site without threatening occupancy. Businesses also tend to find that staff with more diverse roles stay with the company for longer. There is no value to training that trainees forget about. 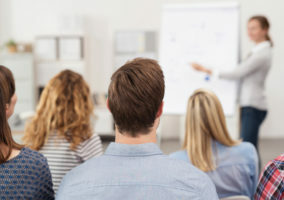 When studying training recall, CEB found that sales representatives had forgotten 70% of the course’s content after one week. After one month, that had risen to 90%. Contact centre leaders don’t want to hear that the training spend needs to go up – but what if the training you do invest in has a much greater impact? Jacqui Turner shares her advice on making training lessons last: “Behaviours have to become habit if they are to be worthwhile. As part of the evaluation at the end of training, ask delegates to think of specific scenarios where they can see themselves applying that skill. The next time they’re in that specific situation, their mind will immediately relate what you did in training to what you should do in that situation. “Another element is to arrange workshops 5 or 6 weeks after the training so delegates can talk about the skills and how they’ve applied them, and the difference it’s made to them. What about the deeper changes? Prevention is better than cure. While it’s helpful to have the kinds of coping strategies we’ve discussed, businesses also need to find robust ways to avoid being crisis-to-crisis operations. “The headline here is, the way we approach our work – panicky – does dictate the experience of the environment. If you never create time to reflect on what matters, you’re endlessly working on those to-do lists,” said Martin Hill-Wilson. Getting more from staff is important, but don’t neglect the nuts and bolts of contact centre operations. 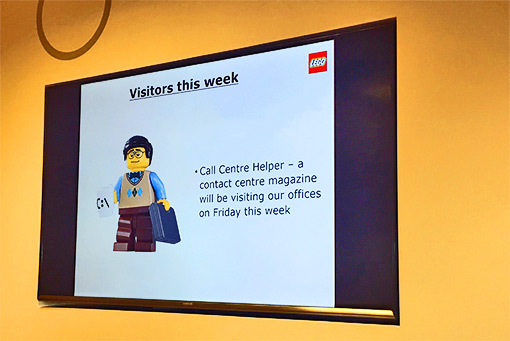 If regular high-volume traffic is getting in the way of planning, why is the contact centre so unprepared? Inadequate funding means that contact centres are frequently understaffed – clearly the only solution to that is to seek more money. But if staffing is inadequate because forecasts are inaccurate, that’s a different matter. If forecast accuracy appears good but experience says otherwise, are you measuring accuracy properly? Perhaps shorter intervals of measurement will reveal that the average over the course of a day is fine, but moment-to-moment it’s always out. If forecasting is generally good but gets caught out by sudden peaks, can you find out what causes those peaks? Perhaps there are cycles you’re not aware of, like correspondence generated by another department. Have you exceeded 85% occupancy? One of the reasons that contact centres stay understaffed is that occupancy is often allowed to exceed 85%. When this happens there is a real chance of burnout. Attrition and absence will increase, and AHT will rise. Contact centres are still finding their feet when it comes to securing the funding that they need. Fortunately, there is an increasing awareness throughout business of the capacity for good customer experience – driven by a well-supported contact centre – to form the cornerstone of a successful enterprise. It’s almost unthinkable now that any board-level meeting wouldn’t reflect on these topics. The trick for the contact centre is to translate that into specific needs that they can meet with specific investments. 80% of contact centre directors feel that budget is a major concern preventing them from running the contact centre they want to. Putting together a business case is also good practice for focusing on and achieving long-term goals.